In this months ‘Where are they now’, we catch up with Julie and her daughter Florrie to see how they are getting on. Why did you choose Kids 1st? Kids 1st Low fell had just recently opened when Florrie was born. When we went to visit, we just saw the building plans and were already impressed. Once it was built, we were invited back for a visit and we were overwhelmed with the layout of the building. Every room was bright and filled with activities suitable for the age of the children in the room. The staff were fantastic! The Nursery Manager Amy, and Lizzie her then Deputy (now Manager of Kids 1st QE) could not have been more friendly and welcoming. We felt very comfortable in leaving Florrie in their capable hands! How did Kids 1st help your child develop? Florrie has always been a sensitive little girl, but thrived during her time at Kids 1st. The staff treat her like their own and she loved every single member from nursery nurses to the cleaners and cooks. Thanks to her time at Kids 1st, Florrie developed into a more confident little girl who loved to go to nursery and pre-school. Florrie is lactose free and has always been a fussy eater. But the Kids 1st staff and chefs could not have done any more to accommodate this. They went out of their way to make healthy and nutritious things that Florrie would enjoy. Florrie has just received her 1st school report and is exceeding in all areas of the curriculum. She enjoys attending swimming lessons where she is working towards her stage 5 certificate. She also attends music and drama lessons, where she has just been part of a performance of ‘High School Musical’! Florrie loves going to Rainbows club, where she has developed even more friendships and skills. As I mentioned above, Florrie was always a fussy eater until she started Kids 1st. She is now on school dinners and is eating pretty much everything that is provided – which is a big achievement for her! How has attending Kids 1st helped them transition into school? 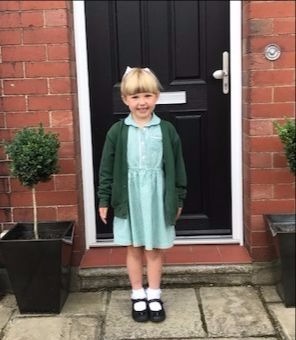 Kids 1st helped Florrie gain confidence and develop her social skills, so by the time she went to school she was more than equipped to deal with the day to day routines and life at ‘big school’. Florrie had developed a strong bond with her key worker at Kids 1st and with her help, Florrie felt no fear about going to school. The pre-school staff worked with Florrie on her phonics and numbers so she had an excellent grounding for reception class. Do you have advice for any new parents considering Kids 1st? Leaving your child with someone for the first time is always daunting – however leaving your child at Kids 1st feels like leaving them with your family. In Florrie’s first few weeks I rang pretty much every day, sometimes more than once! But staff were always more than happy to answer my calls and put my mind at ease. Florrie was always happy at nursery, which to us meant the world. Our 2 year old son now also attends a kids 1st nursery and I would never have considered anywhere else! If you would like your child’s story to feature on our website please get in touch via our contact form using the ‘Where are they now’ option.